The great thing about the JustRite Chirstmas Ensemble that I had for sale last week, is you can also create your own saying with this Curlz Monogram Set. So, if the sentiment in the Christmas Ensemble, Baking Set, and Baby Set does not say what you want to say, you can create your own sentiment by using the Curlz Monogram letters. The 1 5/8 wooden stamper is included. This set sells for $21.95 plus shipping. 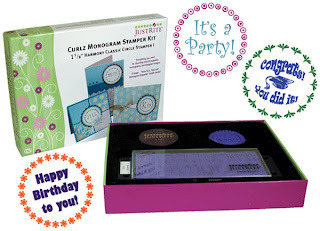 Please e-mail me if you would like to purchase this great stamping set. I accept Visa, Master Card and PayPal.